Thanksgiving is almost here and I just saw that AMD's Ryzen chips dropped in price ahead of Black Friday. 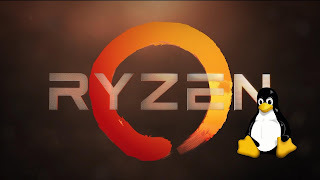 However, I noticed there is very little info on the web about complete Ryzen builds based on GNU+Linux. I have built three Ryzen builds since June of this year. I will talk about the hits and misses in my 4 part post. Since I am a GNU/Linux user I build with ASRock motherboards. We are able to update the BIOS via USB flash drive by locating the BIOS flash file inside of the BIOS itself. GNU/Linux users can also BIOS flash updates via the Internet on an ASRock board. No OS needed. I only use B350 chipsets because I get more for my money. Most of you will be fine with B350, and would only need X370 for multi-GPU setups. A320 does not allow overclocking where B350 and X370 do. No matter which motherboard chipset you choose, it should last you a nice long time. Intel tends to change chipsets every other CPU generation but AMD is planning to support the AM4 platform through 2020. Note: The AMD Ryzen 3 1200 comes with a bundled AMD Wraith Stealth cooler. This is a lower-end and lower-performance cooler. The Wraith Spire that comes with the Ryzen 5 1600 and 7 1700. My personal build (Build 2) uses a relatively budget motherboard, low-end CPU, and a cheap case, opting to spend money on the best (budget) options in the SSD category. It will boot up and load web browsers and productivity programs quickly, and perform well enough in the Steam games I play like Dreamfall chapters and Left 4 Dead 2. Now my build will not let me play games in 1440p or 2160p, but my upgrade options in the future are unlimited. AMD is planning to support the AM4 platform through 2020. Note: I am not against Intel builds. I have an Intel Pentium G4560 (Kaby Lake) system plus a prebuilt HP ProDesk 400 G1 MT Intel Core i7 (Haswell) 4770 based system.